Q: What kinds of stones do you use in your jewelry? A: I use lots of different materials in the creation of my jewelry, including—natural, semi-precious gemstones, glass, crystals, acrylic, resin and plastic beads. Each piece comes with a card in the box that identifies the stones and metals used in its creation. Q: What kinds of metals do you use in your jewelry? A: I use a variety of metals, including copper, aluminum, sterling silver, and silver and gold-plated metals. As the price of precious metals—including sterling silver--has increased I have turned more and more to silver-plated and aluminum metals to keep costs reasonable. Read the card in the box and the product description for a list of what type of metal is used in each particular piece. Q: Do you ever duplicate your jewelry designs? A: Not really! Once in a while I may make a piece that looks similar to another one, but each one is its own unique creation! Q: Do you cut your own beads? A: I do not. To cut rough gemstone into useable beads requires training as a lapidary. I design jewelry with the beads once they have been cut. 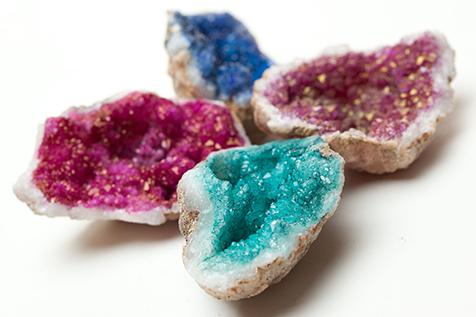 Q: Where do you get your gemstones from? A: They come from all over the world. I buy a lot of gems from here in the US and I also buy from countries such as China, Russia, Africa, Malaysia and India. Each country is known for their specialty stones and I try to find the best of the best, at the best price! Q: Where do you get your inspiration for each design? A: I get inspiration from all types of places—watching people, looking at clothing styles and trends, seeing architecture! A lot of times, I will be thinking about putting colors together and then I create a design out of that, or I will purchase certain stones that have natural striations of color that intrigue me and I start to design based on the color palette. My biggest challenge is balancing the artistic side of making jewelry with the knowledge that, ultimately, they have to be wearable everyday! Q: Do you ever offer home parties? A: Yes! Home parties are a great way to get together with friends, enjoy beautiful jewelry and earn some extra money. You can even use a jewelry party as a fundraiser for your school, civic or religious organization. Go to the Jewelry Party page for more details. Q: Do you make custom jewelry? A: I sure do! Since jewelry is a terrific complement to a special outfit for a special occasion I love to work with clients to create the perfect piece for weddings, bridal parties, gifts, proms and whatever you may need. Please use the info on the Contact page to get in touch with me about your custom needs. Q: Do you make men’s jewelry? A: I do make men’s jewelry and hope to have an entire section of men’s jewelry on the site very soon!